Book of Mormon Central / Archive / How Do You Say "Law" in Hebrew? How Do You Say "Law" in Hebrew? Title How Do You Say "Law" in Hebrew? 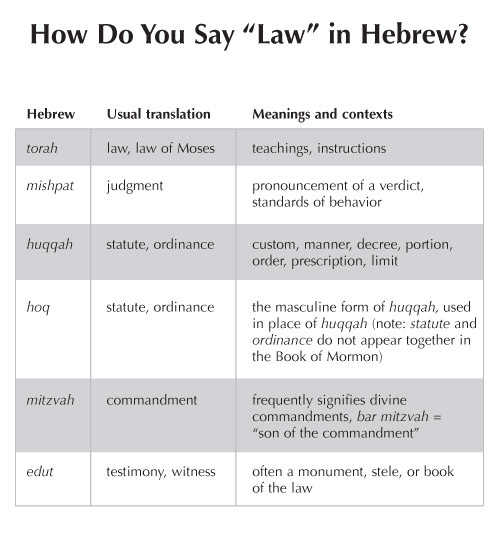 The Hebrew language uses at least six different words that are translated into English as the word law. Torah refers to the law, especially the law of Moses, while mishpat signifies judgment or standards based on the law. Huqqah and hoq are similar in meaning, suggesting not only formal ordinances but also general codes of behavior. Mitzvah denotes divine commandments in general, and edut, while a more ambiguous term, often signifies a written law. For example, King David counseled Solomon to keep God's "statutes [huqqot], and his commandments [mitzvot], and his judgments [mishpatim], and his testimonies [edut], as it is written in the law [torah] of Moses" (1 Kings 2:3). Similarly, Nephi states that his people observed "the judgments, and the statutes, and the commandments of the Lord in all things, according to the law of Moses" (2 Nephi 5:10). The striking similarities between these texts reveal that the Hebrew-speaking Nephites and the ancient Israelites conceived law in much the same way.